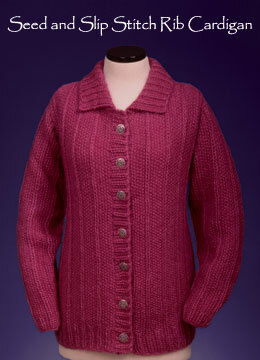 Seed stitch is a very simple pattern to work, and the slip stitch rib adds just the right touch to make this a lovely cardigan. The narrow ribs at the base of the sweater are worked again in the cuffs, button plackets, and collar, which creates a wonderful sense of harmony and flow. Sizes XS - 5XL. Light worsted weight; 18 sts/4" in wide rib pattern.